Stampin' Up ideas and supplies from Vicky at Crafting Clare's Paper Moments: A Bloomin' Marvellous Christmas! Don't you just LOVE this time of year? So many lovely new Sale-a-bration stamp sets to play with and the icing on the cake is that you can get them FREE! 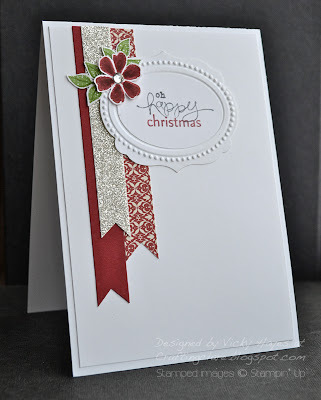 I've been loving playing with the Bloomin' Marvellous set this week and today I'm showing you just how versatile it is by using it to make a Christmas card! Banners are still all the rage and it's so simple to cut your own using designer paper, card stock or Stampin' Up's fabulous glimmer paper. This stuff comes in 12" x 12" sheets and is the least messy way I know to use glitter! Even better, you can get it for free with orders of £150 or more AND you get to choose three of the Sale-a-bration freebies as well - that's a lot of bang for your buck as they say! I made my banners all the same width but varied the lengths and the position I placed them in for a bit of interest. The ends are cut using one of my square punches - how easy is that?! ... and, not forgetting the inside of the card, I stamped them in one corner, leaving plenty of room to write my Christmas message. Yesterday, my daughter settled down to do some homework alongside me as I crafted. She asked me if I minded having music on and I said I thought that would be nice. After a few minutes however I begged her to turn it off. "You said you didn't mind having music on!" she said. "I know," I said. "But this isn't music - it's just a very irritating noise!" To be fair, I normally like listening to her music as it's the only time I get to hear new things. I love all the ways you've used this sweet set, Vicky! I'd never have thought of a Christmas card and think it's fantastic with the flags and gorgeous flower! such a beautiful layout and card! You are SO clever....what a great way to get extra use from that cute SAB set! Lovely! Vicky, this is just WOWSERS!!!!!!! LOVE IT!! Those banners are so pretty and the way you did the frame is sensational! Gorgeous card! Do you think OUR parents ever thought we were just listening to "noise"! LOL! At first I though "Christmas already?" but this is really nice; not too fussy just lovely colours and of course "Bloomin' Marvellous". What a wonderfully versatile stamp set this is becoming! Oh I love how your mind works! This is very inspirational. Thank you so much for sharing. I've been enjoying your other Bloomin' Marvelous cards as well. Oh what a lovely festive make you have here Vicky. Superb! Blooming Gorgeous! And as my daughter would say (while listening to some noise that isn't quite music) "I am Sooooo pinning that"
Great way to pair down a fussy recepie into something clean, simple and stunning! The flower works lovely for Christmas. Hi Vicky, what a beautiful and non cluttered card, as always such a stylish and beautiful inspirational card and the glitter paper looks fabulous. How lovely for it to be decorated on the inside too. Very elegant design Vicky, I love the embossed oval label, and the fun banners. Gorgeous card vicky, love the flowers and the simplicity of your card. Gorgeously simple and effective card Vicky. As for the music, my son loved and since coming back home! loves "head banging" music UGH! Simply beautiful, I love it. CAS and glitter and patterned paper and stamping..... genius! Wow Vicky - I am in awe at the depths of your creativity. You have combined so many things in ways that I would not have ever thought of but absolutely love! I really really love the way you did the sentiment - the mixing of the die shape and embossing frame and the the sentimets. Just fabulous! Thanks for joining us this week at Addicted to Stamps and More! I love the CAS-ness of your card! The banners are very striking against the white background. The embossed label and the flower dress this card up perfectly. Excellently done! Very nice...I am just about to try something very similar on pinterest...Time to start using those ideas! PS Love the colours and lengths you chose for your banner. This looks so elegant. I love it!